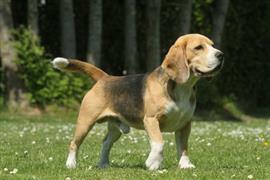 The Beagle is a hound that was originally bred for tracking rabbits. Many fun name ideas can be derived from the breed’s strong sense of smell. One such name idea is Sam (after Toucan Sam, the Fruit Loops mascot known for the famous slogan “Just follow your nose”). Other fun Beagle names include Elmer or Fudd (after Elmer Fudd, the Looney Tunes character known for his love to hunt rabbits). The breed is easily excited and very energetic. For this reason names like Bullet and Dash are increasingly popular among owners. It is hard to mention a Beagle’s excitability without bringing to mind their characteristic howl. A couple of ideas related to this trait include Trumpet and Hal (Howl). Beagles are one of the most favored breeds due to their passive temperament . They make a great family dog and are known to carry a wide variety of names. Some of our pages will contain a subcategory. A subcategory is a slightly more specific grouping than the main topic of the page. For a subcategory, we will include a separated table of names and corresponding descriptions. An example of a subcategory of Red Dog Names would be 'Dog Names Inspired by Red Wines'. If you have any subcategory ideas for the Beagle Names page, we would love to hear them. Use the form below to submit your ideas.